Where Chris Christie Found His Political Calling In four years at the University of Delaware, the New Jersey governor and GOP presidential candidate learned how to build a winning coalition — and found his wife. Gov. 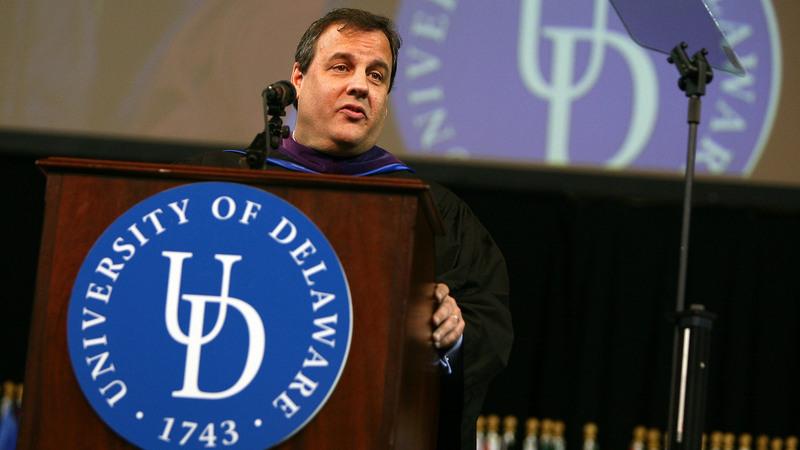 Chris Christie delivers the commencement address at the University of Delaware in January 2011. New Jersey Gov. Chris Christie has wanted to be president of something from an early age. In high school, he was president of his class in ninth, 10th, 11th and 12th grades. At the University of Delaware, he was president of his dorm and ultimately president of the student body. It was there that the political style of the ambitious and sometimes unorthodox Republican presidential candidate first began to take shape. 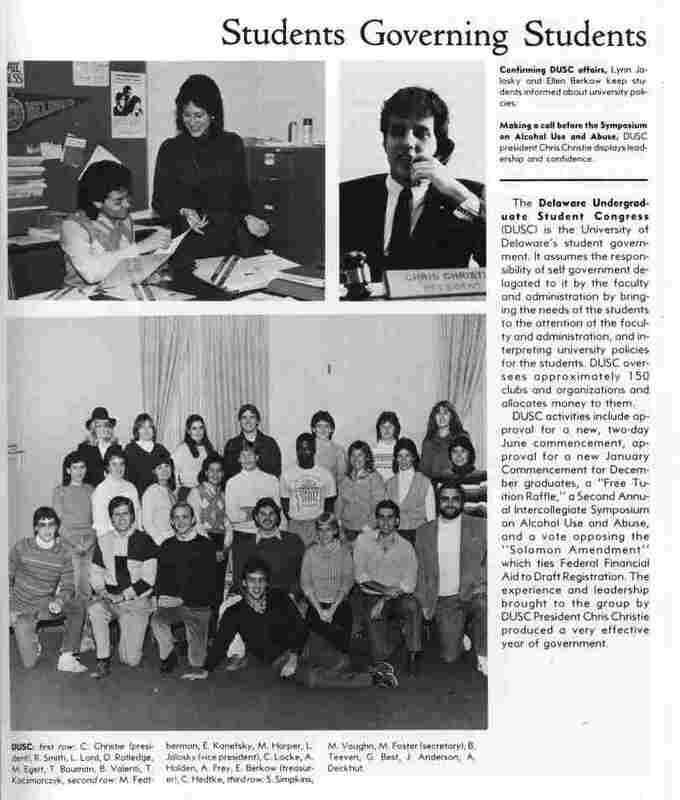 When Christie arrived at the University of Delaware's campus in Newark, Del., in 1980, he did two things. First, as Christie reminisced to students a few years ago, he partied. "My 18th birthday was celebrated right here at the University of Delaware as I began my freshman year. Of course the drinking age was 20 so I couldn't drink too much on my 18th birthday," said Christie. Then, in his dorm room, he voted for the very first time. "In 208 Harrington E, I filled out my absentee ballot and voted for Ronald Reagan," recalled Christie. It was politics more than partying that defined Christie's four years at Delaware, the only time he has ever lived outside his home state of New Jersey. He was a political science major who was an eager student with excellent analytical and writing abilities, recalled James Magee, his professor in a class on civil rights and civil liberties. Christie sat in the front row, in the same seat. Every day. "He was one of the best students I had in constitutional law in nearly 41 years of teaching," said Magee. Magee and old friends remember how Christie forcefully argued his right of center positions. But in contrast to the governor who made a name for himself yelling at constituents and reporters on YouTube, no one remembers Christie raising his voice. In fact, quite the opposite, said friend Ellen Feldman, who got to know Christie when he joined the student government. "Watching him navigate how to get things done and understanding the lay of the land, and kind of having a goal set and figuring out how to do it by involving the right people, and making sure you involved the right people, he did that so well," said Feldman. Christie first joined student government as a lobbyist, traveling to the state capitol in Dover and to Washington, D.C. He organized opposition to President Reagan's proposed cuts to student loans and he personally lobbied Delaware Sen. Joe Biden, the future vice president. He set up phone banks so students could call congressional offices. "Our goal is to tie up the switchboards," he said at the time. He then ran for president of the Delaware Undergraduate Student Congress against a popular student. But Christie, now known as a tireless campaigner, worked harder. And he secured a key endorsement from the student newspaper, The Review, in a moment reminiscent of how he worked to land an important endorsement of the largest paper in New Hampshire in the current presidential campaign. 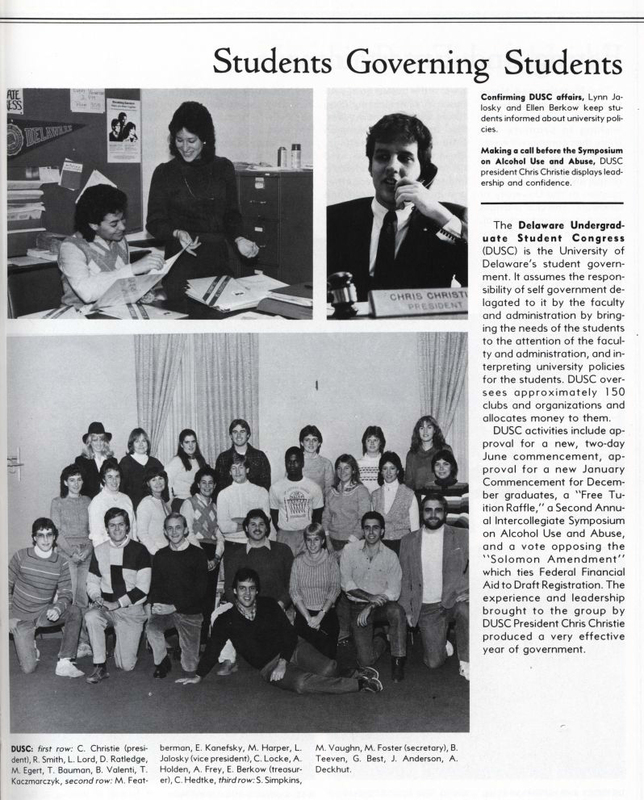 Chris Christie was seen as an effective leader during his time as Undergraduate Student Congress president, as seen in the commentary in the University of Delaware 1984 yearbook. "Chris had a much better handle on issues, on how to deal with people and had a real organization behind him. They had signs and got out the vote kind of activity," said Tobias Naegele, the then-editor of The Review and now a journalist. Christie's platform called for "breaking out of old molds" to solve problems. His campaign targeted campus groups, where members vote in higher numbers, and he built a coalition to win. He asked the president of the Black Student Union, Kelvin Glymph, to join his ticket. Glymph says Christie did so because he wanted black support. "That was probably his strategy," said Glymph. "He was politically astute." The strategy worked: Christie took more than 60 percent of the vote. As president, Christie created an activities fee, $10 a semester per student, to help fund student groups. He quoted John F. Kennedy to successfully push for the creation of teacher evaluations for students. Thirty years later, teacher evaluations would be a centerpiece of the governor's education reforms. Christie also spoke out against anti-Semitic and racist incidents that roiled the campus at the time. When Christie witnessed a white student yell a slur at a group of black sorority pledges, Christie called for starting a quote "movement of understanding, caring, compassion and guts." "It doesn't surprise me one bit that Chris would be one of the college kids to stand up against this racial discrimination. That's the way he was," said Magee, his former professor. Christie and Glymph, of the Black Student Union, became friends. "He was very conscious about what was going on, getting advice from me, getting perspective with things happening on campus, how it affected us," said Glymph. Christie created a diversity committee, which was unusual for that time. On the committee he appointed of the president of the Gay and Lesbian Student Union and a women's rights activist. The committee issued recommendations that called for cross-cultural education, which Naegele described as part of Christie's efforts to always try to understand the other side. "The idea being you have to expose people to other ways of life and that should be part of what the university experience is," said Naegele. These characteristics may not sound familiar to those who have heard his recent rhetoric in the presidential campaign. He has called for banning Syrian refugee widows and children from entering the country and denounced the Black Lives Matter movement for inspiring cop killers. But his time in New Jersey, as governor, has been notable for his efforts to reach out to different demographic groups, nominating a black gay lawyer to the Supreme Court and appointing Hispanics to prominent positions. That strategy helped Christie win 51 percent of the Latino vote in his re-election. Christie also spoke in blunt terms defending his appointment of a Muslim to a county judgeship, even as some conservatives claimed the judge would enforce shariah Islamic law. "It is ridiculous and insulting that because I nominated Sohail Mohammed that people somehow think that that means I'm somehow for shariah law. It's crap. And it's the only way I can describe it," said Christie. Christie has said he formed his political philosophy back at the University of Delaware, in political science classes. But he took something else away from school. One of those students on his diversity committee was named Mary Pat Foster. The two were friends and Christie put Foster on his ticket when he ran for student body president. But after a night at the Deer Park Tavern on the outskirts of campus, he noticed her on the dance floor in a new way and they started dating. A year younger, Mary Pat succeeded her boyfriend as president of the student body. A year after that, they were married. Their 30th anniversary is March 8, a week after Super Tuesday.